For this month's "Maps Of The Month" featurette, I wish to draw your attention to FlyingArmor's Lennus II: Fuuin no Shito (J) (Super NES) maps. There are a lot of RPGs on the Super NES (and Super Famicom). We've honoured some of the really popular ones like Final Fantasy VI and Chrono Trigger, but it would be injustice if we didn't mention some of the lesser-known ones that look just as good, and are mapped just as thoroughly. Lennus II: Fuuin no Shito (J) is the Japanese-only sequel to (the somewhat obscure) Paladin's Quest. Both of these games don't look like most conventional fantasy RPGs. You know what I mean...the green forests, the brown or grey mountains, the blue seas. But in these Lennus games, right away you can tell the palette choices are unique - look at all that purple! - and the architecture is so varied and intricate! From the domes in Cameron to the egg-shaped buildings in Conshuito, from the organicness of Zorban's Belly to the technological marvel of The Throne Of The Immortals, every area seems a little more inspired than your run-of-the-mill role-playing game. FlyingArmor has mapped a few RPGs here for VGMaps, including the original Paladin's Quest (honoured back in September 2009). His thorough work here has brought us nearly 90 maps, so you won't miss a single item, whether from those pod-shaped treasure chests, or even those that are hidden! You should have no problem helping Farus retrieve the four items necessary for the "Great Union". 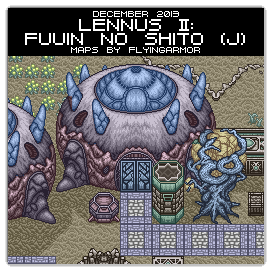 So to acknowledge the effort put into mapping an obscure and underrated 16-bit RPG, FlyingArmor's Lennus II: Fuuin no Shito (J) (Super NES) maps will be known as VGMaps.com's Maps Of The Month for December 2013. I just realized how similar my write-up for this is compared to the one for the first game, Paladin's Quest, back when it was honoured here. Also, both times, the Maps Of The Month update was a little late - the first time around, it was just the topic, this time around it was only by a few hours - but still, considering that it is otherwise never late (if I recall correctly). Sorry about that! Another giant down, you've got a good sized hoard now Flying Armor. Thanks so much. It looks like all the completed map sets I've submitted to the site have received this honour now. I'd agree with this game being a giant pain in the neck to map. All of the working PSD files for these maps amount to well over 1 GB. I also had to rely heavily upon BGMapper for a lot of the maps, seeing as how any area that utilized a transparency for water or whatnot shared the same layer as all the scenery you can walk behind (the top halves of trees, buildings, etc). This caused that scenery to have a slightly different palette than what it would normally be, so having to capture those parts separately was a bit of a pain. But in the end they look all the better for it. I also wasn't exactly planning on mapping this game to completion this year. I think it started when I came across a walk-through-walls code someplace and things just happened to take off from there.